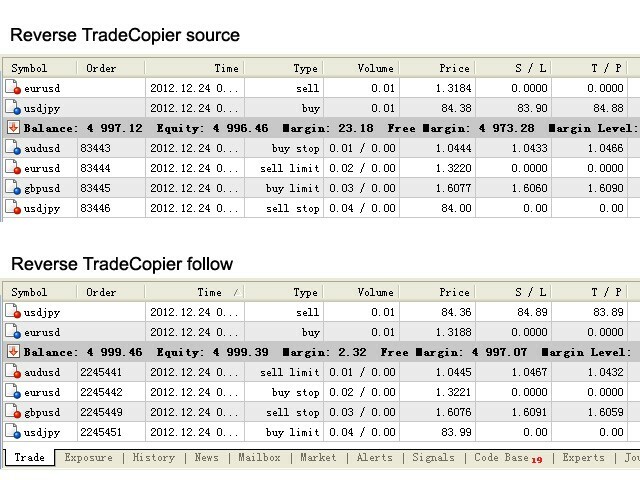 Reverse TradeCopier Follow can copy trades from an account that is running Reverse TradeCopier Source. Copies trades from one source (master) account to multiple following (slave) accounts. Allow investor (read only) password for source (master) account. There are no complicated settings and input parameters, everything is easy. Works with different quotes symbols (EURUSD_FX, eurusd_m, etc.). Can copy orders from 4-digit quotes platform to 5-digit quotes platform and vice-versa. Allows copying trades between brokers with instant execution and brokers with market execution (ECN). The volume for the following account is chosen by the difference of FreeMargin between source account and the following account. Minimum and maximum is limited by the platform. It is better than fixed lot size. Copies signals of Expert Advisors as well as Manual trades. "Reverse Trades Follow Report" is generated for each follow account. The path is "MT5 terminal\MQL5\File\Reverse TradeCopier\". 1. Download "Reverse TradeCopier source" and run it on master terminal (source account). 2. Download "Reverse TradeCopier follow" and run it on slave terminals (following accounts). 3. Be sure to allow AutoTraing. If you trade manually or trade using another EA on a following account, "Reverse TradeCopier Follow" will exit. It does not copy positions/orders, which were opened/placed before running "Reverse TradeCopier Source" and "Reverse TradeCopier Follow". The price for trade operations on following accounts may have tiny difference from the source account if they are from different platforms (brokers) or if market is violent. The follow account has been changed. Fixed problem caused by MetaTrader 5 upgrade. Fixed the error of the report file name. Allow users deciding whether to place pending orders or not. Allow user set with or without StopLoss/TakeProfit level. Follow account: free margin = 1000, leverage = 200.